Here we have two transverse sections through a heart. 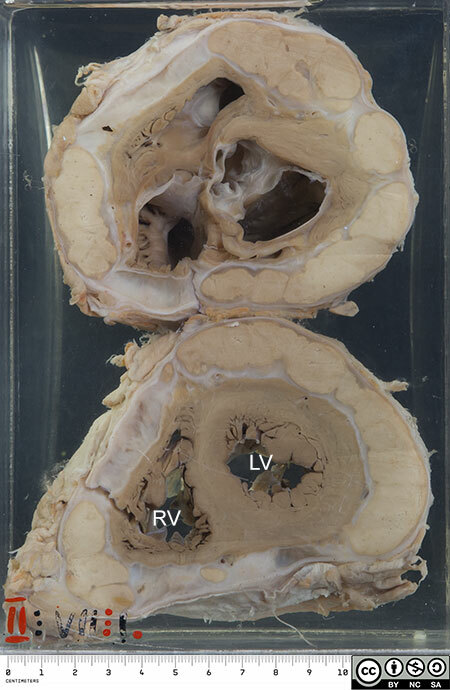 The lower section cuts through the left and right ventricles. The upper section has been made near the base of the heart where the great vessels enter and exit. The pericardium is a double walled membranous sac that encloses the heart. 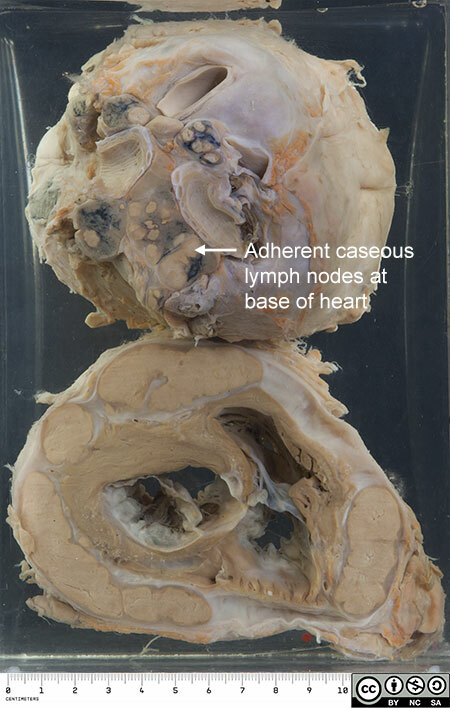 Between the parietal (outer) and visceral (inner) pericardial layers lies the pericardial cavity, a slim, fluid-filled space, but here the pericardial cavity is grossly widened by large areas of caseation in a shell of organised fibrosis. This is the late stage of tuberculous pericarditis. Probably at an earlier stage there would have been an exudative effusion, amenable to aspiration. The bottle has been reversed. Unfortunately no clinical data was recorded for this patient. He would undoubtedly have had symptoms and signs of a constrictive pericarditis, such as dyspnoea and venous congestion. His heart has gradually been compressed and cardiac output reduced. On ausculation the heart sounds would be muffled. A ‘pericardial knock’ might be heard; this is a early diastolic sound caused when the rigid pericardium abruptly halts ventricular filling. There would be ECG and echographic changes, and the pericardial thickening would best be seen on CT or MRI scan. Tuberculosis is a rare cause of pericarditis and constrictive pericarditis in the developed world. However, tuberculous pericarditis is common in Africa and is increasing due to the HIV epidemic. Treatment is anti-tuberculous therapy and sometimes pericardiectomy is required. Reference: Mutyaba AK, Ntsekhe M. Tuberculosis and the Heart. Cardiology Clinics. 2017; 35:135-144.